Three Incidents: Tank Truck Explosion, Television Interview Railcar Fire, and International Destruction of Acrylic Acid Railcar Using "Vent and Burn". – Bob Rosen. World Wide Electronic Specialty Gas Emergency Response Program. – Eugene Y. Ngai. Unplanned Shutdown Plus Lack of Knowledge equals Incidents. – Albert Ness. Community Involvement Requirements for the Albertan Upstream Petroleum Industry. – Gary L. Neilson, P. Phys. Existing Side–By–Side: A Look at Community Alert & Emergency Response Issues in the Petro–Chemical Industry. – Johnnie A. Banks. Joint Leveraging of Industrial and Community Assets: A Partnership Between Industry and the Community to Improve Emergency Response Capabilities. – Max E. Middleton. Trash to Treasures. – Ted Low, Kris Smith. Liquefied Natural Gas Issues Planery Session. Safety and Fire Protection Consideration for LNG Terminals. – John A. Alderman. Blast Wave Damage to Process Equipment as a Trigger of Domino Effects. – E. Salzano, V. Cozzani. LNG Terminal Operations Hazard Zones. – Robin Pitblado. Emergency Response of Toxic Substances in Taiwan: The System and case Studies. – Jeng–Renn Chen, Chung–Hsun Hung, K.S. Fan, Ta–Cheng Ho, Fan–Lun Chen, J.J. Horng, Wen–Der Chen, Shun–Chin Ho. Improved Safety at Reduced Operating Costs in a German Chemical Plant. – W.Steinert, M. Begg, R. von Dincklage. Active Shooter Table Top Exercise Process for Schools. – Larry G. Holloway. Applying Inherent Safety to Mitigate Offsite Impact of a Toxic Liquid Release. – Douglas J. Ferguson. Extended Indoor Explosion Model with Vertical Concentration Profiles and Variable Ventilation Rates. – John Woodward, J. Kelly Thomas. Accounting for Dynamic Processes in Process Emergency Response using Even tree Modeling. – Raghu Raman. Fuzzy Logic Methodology for Accident Frequency Assessment in Hazardous Materials Transportation. – Yuanhua Qiao, Michela Gentile, M. Sam Mannan. Case Histories I Plenary Session. Development of Detailed Action Plans in the Even of a Sodium Hydride Spill/Fire. – Claire Fluegeman, Timothy Hilton, Kenneth P. Moder, Robert Stankovich. System Improvements Utilizing FMEA and Fault Tree Analysis. – Tracy Whipple, Michelle Roberson. Lessons from Grangemouth: A Case History. – Michael Broadribb, William Ralph, Neil Macnaughton. Transportation and Value Chain Plenary Sessions. A Graphical Method for Planning Security Vulnerability Analyses of Transportation and Value–Chain Activities. – Michael Hazzan, Irene Jones. Emergency Preplanning in Pipeline Construction. – Chuck Goode, Tim Brabazon. Reducing Value Chain Vulnerability to Terrorist Attacks – A.M. (Tony) Downes. Case Histories II Planery Session. Lessons Learned from a Major Accident Involving Uncontrolled Molten Sodium Release. – A. Wilson, R. De Cort, W. Crumpton. 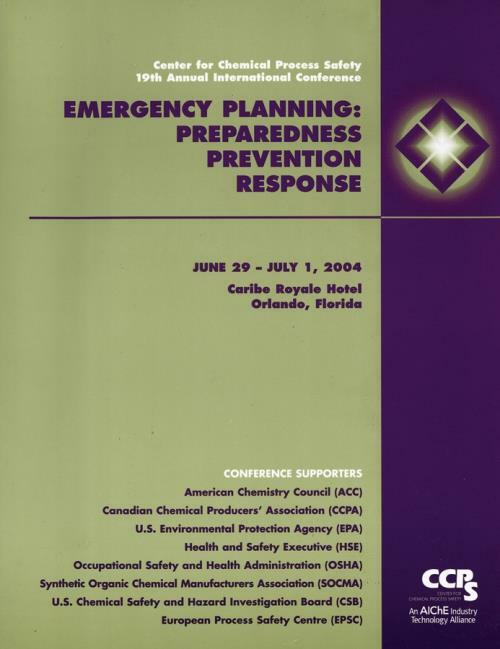 Emergency Response to a Non–Collision HAZMAT Release from a Railcar. – R.A. Ogle, D.R. Morrison, M. J. Viz. CSB Incident Investigation. – John B. Vorderbrueggen. Layer of Protection Analysis Plenary Session. Managing the Financial Risks of Major Accidents. – Luke Chippindall, Dennis Butts. Initiating Event Frequency Case Study: Electrolytic Cell Process. – Stanley Urbanik. Use of Layer of Protection Analysis (LOPA) within The Dow Chemical Company. – Tim Overton, Tim Wagner. Legal and Regulatory Issues Plenary Session. Implementing Personnel and Organizational Management of Change (P&O MOC) Processes. – Frank Broussard, Heather Harriss. Major Hazard Control in Canada: A Change in the Regulatory Landscape. – Graham D. Creedy, John S. Shrives, Gerry Phillips. Defending OSHA Facility Siting Citations. – Mark S. Dreux. The ATEX Directives: Explosion Safety and Regulation – The European Approach. – N.H.A. Versloot, A.J.J. Kelin, M. De Maaijer. Thermal Stability of Materials During Storage and Transport. – Bob Venugopal. Theory of Incident and its Prediction in the Process Industry. – Jenq–Renn Chen.